Cinqo de Mayo at The Bookstore! So, hopefully by now most of you have heard me talk about my very favorite bookstore, an indie in Glen Ellyn, IL called The Bookstore. I found it originally by tweeting with two of the fabulous booksellers there, Sue and Margie, although all of the booksellers there are terrific. Ever since my first visit, I try to go at least once a month, although I tend to feel jumpy if it has been more than two weeks. It is my favorite place to go and have bookish talk offline. 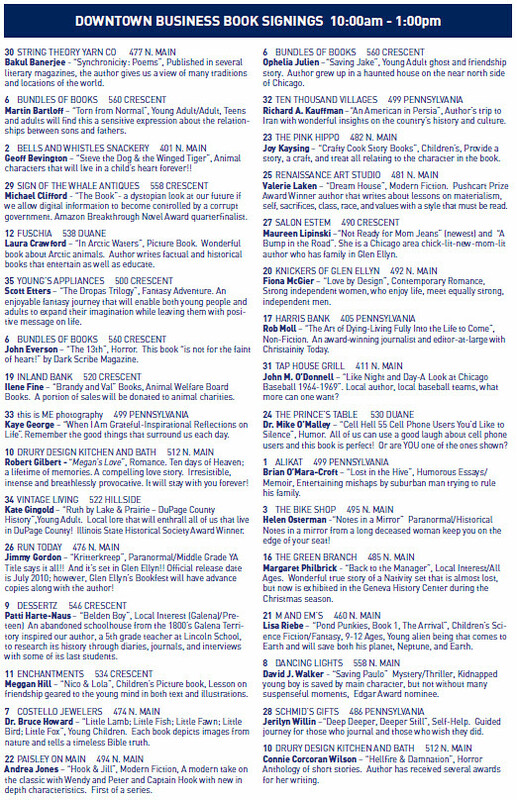 By the way, if you’re in the Chicago area, you should come and check out the Glen Ellyn Bookfest on June 19th, I’ll be there! 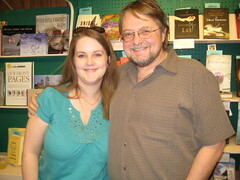 On Wednesday, the wonderful people at The Bookstore organized a fantastic event with Luis Alberto Urrea. Luis has written, among other things, “Into the Beautiful North” and “The Hummingbird’s Daughter.” I own both of those books, but haven’t read either of them yet, although I did read his nonfiction work, “The Devil’s Highway” in preparation for this event. I took my Mother-in-Law with me, and she read “Into The Beautiful North,” which she is really liking, even though she has not yet had time to finish it. And what an event it was! In addition to the awesome Luis, The Bookstore provided margaritas and a local Mexican restaurant, Chicks and Salsa (love the name! 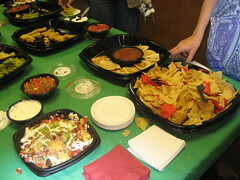 ), provided appetizers. But the real highlight of the evening was Luis’s talk. 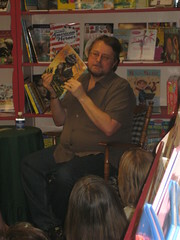 He was there partially to promote his new book – a graphic novel, “Mr. Mendoza’s Paintbrush, ” which is not yet officially on sale but which the publisher sent to The Bookstore for all of us to be able to buy. You’d better believe I picked one up. Luis is amazing. 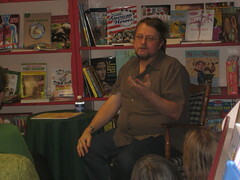 he is just a fantastic storyteller (I know, I know, maybe why he is a successful author?). Not only that, but he has lived a really amazing life. He was born in Tijuana to an American mother and Mexican father but moved to the United States when he was young, although he returned to the Tijuana garbage dumps later in life to do missionary work. He talked at least briefly about all four of his full-length books and oh my GOSH did he ever make me want to read all of them! I mean, I guess that’s the point of something like this, but still. I was seriously tempted to throw all my obligations out the window when I got home and just binge on his work for awhile. I also want to say, that both Luis and his wife Cindy seem like really sweet, awesome people. I wish them the best of luck on their upcoming book tour! Showing off "Mr. Mendoza's Paintbrush"
I received no compensation for this post, other than a great evening that was free for everyone – oh, and that book Sue lent me! I did spend a good deal on books while I was there, though.